Current transformer rated frequency 50Hz, ATO provides a series of different current ratio, 200/5A, 300/5A, 600/5A to 1000/5A. Small size and light weight. Current transformer rated voltage up to and including 0.66 kV and rated frequency 50 Hz. Current ratio can be selected 5/5A, 25/5A, 50/5A, to 70/5A, Secondary load can be selected 0.5s, 0.2, 0.2s. 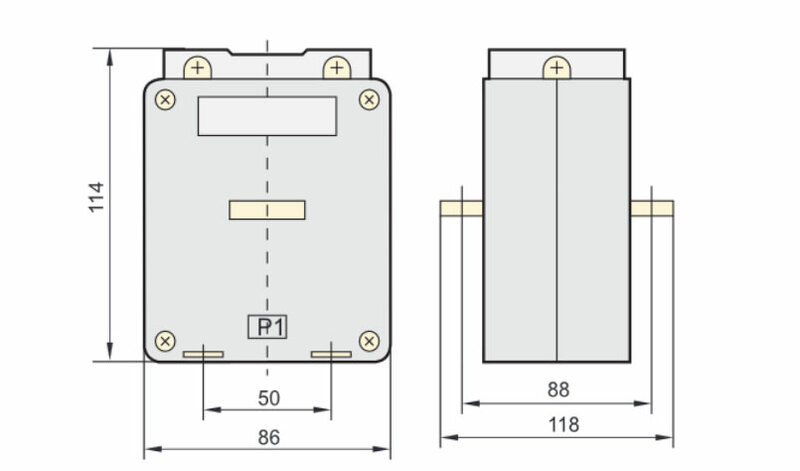 Current transformer is used to convert large currents in the AC circuit into a small proportion of current for measurement and relay protection. Current ratio 250:5A, 400:5A, 750:5A, 800:5A to1000:5A, light weight, good quality and free shipping. There should be no open circuit on the secondary side of the current transformer in operation. Once the open circuit occurs on the secondary side, high temperature caused by excessive iron loss may burn out the current transformer or enhance the voltage of secondary winding, thus breaking down the insulation and leading to the danger of high voltage electric shock. Therefore, when replacing a meter such as an ammeter, active power meter and reactive power meter, please ensure the current circuit in short circuit before operation. If the current transformer makes a buzz sound, please check if the internal core is loose, fasten the core bolt. Shell of the current transformer’s secondary side shall be grounded reliably. When the insulation resistance of the current transformer’s secondary side coil is lower than 10~20M ohms, drying process is required to recover the insulation before use it again. When the current transformer gets faults, safety operation of the primary system circuits will be affected, please report promptly to the higher authorities and heads of departments concerned to cut off the fault current transformer timely, then treatment it. As for the open circuit of secondary winding, treatments shall be implemented according to actual conditions. After necessary safety precautions are made according to relevant regulations, the current transformer can be put in use again. It's a cheap price, and I bought two current transformers, one current ratio 300/ 5A, and a current ratio 400/5A. They worked very well, and accurately, the quality is in my demand.